(2) semi's with drop deck trailers. Like us on Facebook to see the equipment in action. With this line of equipment, we can bale large quantities of hay at one time, ensuring a very consistent product. Check out my YouTube link or like us on Facebook to see the equipment in action. We travel every year to Orleans, Wyoming, Cattaraugus, Chautauqua and Erie to do custom work. We spend 3 weeks in Orleans County every year and work south following the wheat harvest. Most loads are delivered right off the field. We have delivered up to 15 semi-loads in one day and can handle some very large and small jobs. Call us if you need some straw during the season or live in the Orleans area and have straw to sell. And check me out on FB! 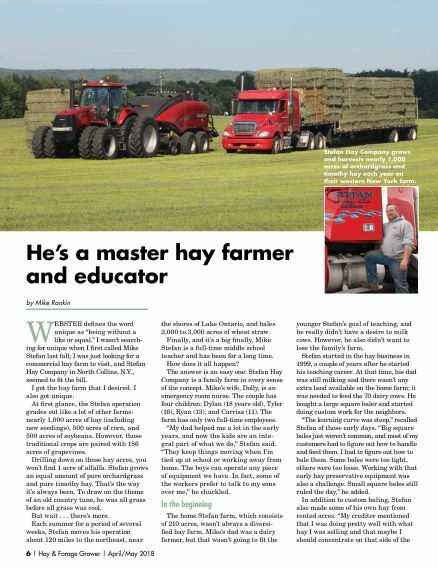 Check out this Hay & Forage Grower Magazine featured article on Stefan Hay Company! This article tells our company's story, from our Quality straw and grass to our passionate teaching skills. My father and I were dairy farmers until 1999. As a result, we understand the product that dairymen request for their herds' nutrition. Presently, I teach technology in the public school system. While teaching takes up quite a bit of my time and energy, I continue to be committed to the agriculture industry and dedicated to providing only the highest-quality hay for my customers. I love working in agriculture and stay involved in it because of the joy it brings me. Additionally, my product is made by using the most up-to-date agricultural practices and technology.